The subject of this post is in response to a query by a client Lynn Buckley about my last post on retouching old photos. 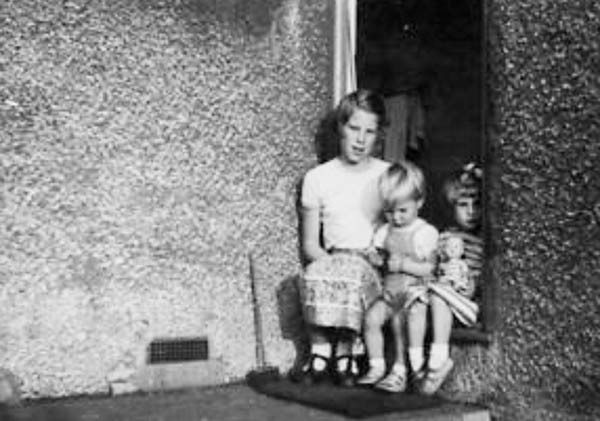 As a postscript Lynn went on to scan the negatives she had and the pictures were used in a book about her family in Ireland. Lynn’s query was about the scanning of glass plate negatives. The scanning of negatives that are going to be enlarged is different to scanning a photo to be printed at the same size. The first thing to say is – think about all the possible uses for the pictures that will be created from the scans. you want to make prints that are bigger than the negative? prints be printed on an Inkjet printer or by a professional printing press? the scans only be used for pictures on the web? the pictures be projected digitally? a combination of print and web/projection be required? I use an Epson V750 Flatbed Scanner in the Professional Mode, this gives me complete control over the scanning process. I guess all scanners have a basic mode if you are not sure what you are doing. 1 – If your Scanner has dust and scratch reduction software built-in do NOT use it on silver based ie glass negatives. The software will think the grain that makes up the picture is dust and do very odd things. 2 Does your scanner allows you to crop the picture before the final scan? 3 Can do a preview scan? 5 A less contrasty scan is better than a scan that has too much contrast. Contrast can always added later. 6 As a general rule, it’s better to do a high-resolution scan and have a larger file than making a small low resolution file and then trying to make a big picture. You can easily go down but not up in size. 7 Be aware of dust on the scanner platter & negative, attention to detail will save time later. The scanning resolution pixels per inch (ppi) must always be at least the number of the printing resolution (dots per inch) dpi. Say for example you what to make a 12×12″ print from a 6x6cm(2 1/4″) from glass negs you have, using an inkjet printer. The scan will need to collect and provide enough information to print the created file at 240 dpi (dots per inch). Therefore the absolute minimum scanning resolution required is 240 ppi without enlargement. For example 12″ divided by 2 1/4″ is a 5.3 times enlargement. 5.3 x 240 dpi of the final print gives 1272 ppi scan to take the enlargement into account. The nearest scanner resolution is 1200 ppi. Depending on the quality and detail of the glass negative I would probably opt to scan at 2400 or 3200 ppi. Obviously, the more detailed the scan the larger the file. Say some of the scans will end up in a book at say 8″ square. A professional printer will always ask for files at 300 ppi. You need enough pixels to print 8″ from a 2 1/4″ Negative. Therefore 8″ divided by 2 1/4″ is a 3.55 times enlargement. 3.55 x 300 dpi of the final print gives 1066 ppi scan to take the enlargement into account. Depending on the quality and detail of the glass negative I would probably opt to scan at 1200 or 2000 ppi. Most professional off-set printers require scans or files in CMYK colour space with a specified CMYK Profile. The Conversion to CMYK and the application of the Working Color Space Profile can only be carried out in Photoshop, Lightroom cannot do the job. Say you are only ever going to use these scans for the web or digital projection. All desktop computer monitors and digital projectors have a resolution of 72 dpi there is no need to make highly detailed scans in this case. You need to decide how big you picture will appear on the screen for my blog the pictures are 800 px on the long side. If you are going to project them the standard width is 1400 px. I use Lightroom all the time. The scanned files will need to be imported into Lightroom. To get the pictures in the required sRGB color space for the web, at the right size and resolution I use the Export feature of Lightroom. Lightroom when Exporting a file will make a copy, resize it, correct the resolution and then put the copy file where you told it to. If you have a number of files to do, you can make a saved Export pre-set so all the Exporting is done with one click,. I have added a new Lightroom Support Playlist containing a video how to create a Lightroom Export Pre-set.